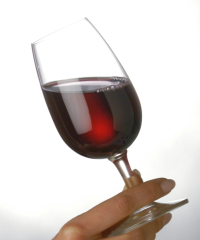 Cabernet Sauvignon is a noble grape variety (vitus vinifera). It produces fuller-bodied, deeply coloured (mostly opaque) and structured red wines with great capacity for ageing. Classically known as a key component in the famous red wines of Bordeaux it is now grown around the world. It is best blended when it's grown in cooler climates (Bordeaux, Hawkes Bay, New Zealand or British Columbia) but when grown in warmer climates such as Napa Valley, it can shine on its own. "Green" flavours (caused by pyrazines) in Cabernet are more common in cooler climates with shorter growing seasons. With longer growing seasons, aka time on vine these pyrazine or "green" flavours are greatly if not totally diminished. Although classic descriptors of Cabernet Sauvignon include black currents (or cassis), graphite or pencil lead, mint, tobacco, cigar box and yes, even bell pepper, around the world it can take on the character of the place it's grown - it's terroir. Cabernet Sauvignon is grown almost everywhere; it is grown in Italy (most famous in Bolgheri, Tuscany), Eastern Europe, Spain, Portugal and France. It is grown in Australia and has become famous in Western Australia in Margaret River and in South Australia's Coonawarra. It is also grown in Hawkes Bay on New Zealand's North Island. It is grown across South America and thrives in Napa Valley as well as Washington State. It is grown in Canada in South Africa, where it is becoming increasingly popular. The genetic parents of Cabernet Sauvignon are Cabernet Franc and Sauvignon Blanc.